Bed linen was once entirely functional and fit for purpose, but these days we are demanding much more from our bedding, insisting upon options which are not only practical, but are also stylish and which reflect individual personalities. When choosing new linen, first consider the tone of the room and identify your style. Pretty feminine florals would look out of place next to ultra modern furniture, while stark, minimalist designs would not compliment shabby chic interior design. 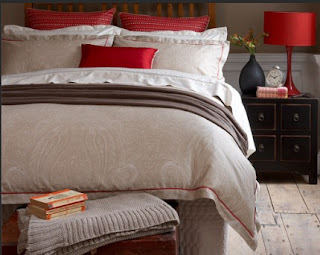 Before selecting bed linen UK companies have plenty of choice so narrow it down by first casting a critical eye over the bedroom and decide if there is already a feature or whether the bed linen will provide the focus. This will determine whether plain or patterned designs are best suited. Also look at the furniture, art and curtains and avoid busy patterns if there is already a lot going on in the room. Instead consider picking out a colour and applying that colour to your choice of bedding. With an overwhelming amount of choice when it comes to bed linen UK suppliers can be of assistance by helping you to pinpoint the type of option best suited on an individual basis. You may find you like simple elegance or are hoping to create something fun, but by considering the other aspects of the room, it's less likely that you will make a rash decision or choose in error. By setting the tone and working out what your personal style is, you are more likely to find bedding which suits the room and reflects your own personality. As well as considering the style, functionality is a key concern so the quality should also be something to think about. The thread count is something to consider and generally the greater the thread count the better the quality. Bed linen can be made from natural or manmade fabrics, or a mix of both so choose practical or luxurious materials, depending on preference. Pure cotton is a good everyday choice while fabrics like silk and satin add a touch of luxury. When it comes to pillows, opt for the two standard pillowcases only, or perhaps plump things up a little by adding some scatter cushions for a greater effect. It's also a good idea to think about whether or not you would like to accentuate with additional throws or related accessories. Bed ruffles have decreased in popularity over the years but are once again becoming fashionable, especially if the intended effect is French or English country style, or 1950's floral inspired. The added bonus of ruffles is that they effortlessly conceal all that clutter stashed under the bed, creating a more streamlined finish! Whether you prefer crisp, white linen and a classic look, or favour deep, opulent shades for a sense of the exotic, there is bedding available to create each specific look. By looking at the bigger picture and figuring out your personal style it's easy to tailor your choice accordingly, resulting in an overall effect which is coordinated, personal and comfortable. Ilena Sanchez writes regularly on themes including interior decorating and home improvements for a range of bed linen UK websites and blogs. Despite inhabiting modest quarters, he likes to add a touch of luxury and opulence to his furnishings.